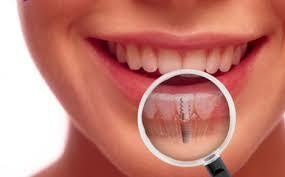 Dental Implants are rising quickly in popularity as the safest choice for replacing teeth. Especially in Los Algodones, because the cost of Dental Implants is significantly lower than the US. A patient can choose to replace a single tooth, get dentures or bridges, making Dental Implants a versatile option. Knowing this, a lot of people cross the border to seek Dental Im plants and other dental treatment among Los Algodones dentists. It is safe to say that the best option is Dental Solutions. Our clinic has specialists in implants, they are really well versed on the subject and fluent in English. Besides they use Nobel Biocare implants, the best on the market. To give our readers a more detailed view on Dental Implants let’s see how they work exactly. We can start by saying that Dental Implants consist in a metal post or frame, surgically installed into the jawbone beneath the gums. This is done carefully by the dentist and the help of specific tools. Once your Dental Implants are in place, the dentist can finally to mount the replacement of your next set of teeth onto them. It is important to notice that to determine how the dentist places the dental implants he or she uses a CT scan. What a CT scan does is to allow your dentists to see your mouth in 3D. This will help to see how your jawbone structure and detect if the patient need bone graft to hold the Dental Implants. 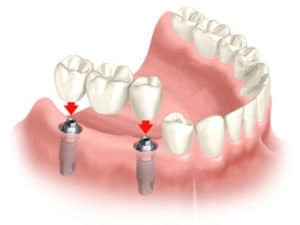 How do the Dental Implants work for replacing teeth? Dental Implants fuse to the jawbone providing a stable base for artificial teeth. Dentures, bridges and crowns can be mounted into the Dental Implants as replacement for teeth loss. If the Dental Implants are really well done, they won’t slip or shift in the. This is crucial for the patient when they eat or speak. The secure fit of the Dental Implant is what makes the dentures, bridges, and crowns feel just like natural teeth. For some patients, ordinary bridges and dentures just simply do not cut due to discomfort. They can experience sore spots, poor ridges and even gagging. This added to the fact that ordinary bridges must be attached to the teeth located on either side of the missing tooth. This is a point on Dental Implant favor. As they do not need any adjacent teeth to be prepared or grinded down to hold not only the implants. But the new teeth replacement solidly in place. To be an eligible candidate for Dental Implant. It is important to have healthy gums and adequate bone to support the implant as we said before. A consistent oral care routine is key to project the success of Dental Implants in the patient’s life close to a 100%. Dental Implants are usually seen as an expensive option for tooth rep lacement. Most American insurance typically cover less than 10% of the fees. But in Dental Solution in Los Algodones Mexico you can save 50% of the price. Consult our price page to know more about prices. Endosteal implants that are surgically implanted directly into the jawbone carefully. When the surrounding gum tissue has healed, the patient will need a second surgery to connect the post to the original implant. Then an artificial tooth is attached to the post individually, or they can be grouped in a bridge or denture according to the patient’s need. Subperiosteal implants are cool because they consist of a metal frame that is carefully fitted in the jawbone and just below the gums. As the gums are healing, the metal frame becomes fixated to the jawbone. Then the posts that are attached to that frame protrude through the gums. Like the endosteal implants, artificial teeth are then mounted to the posts later individually or in groups.